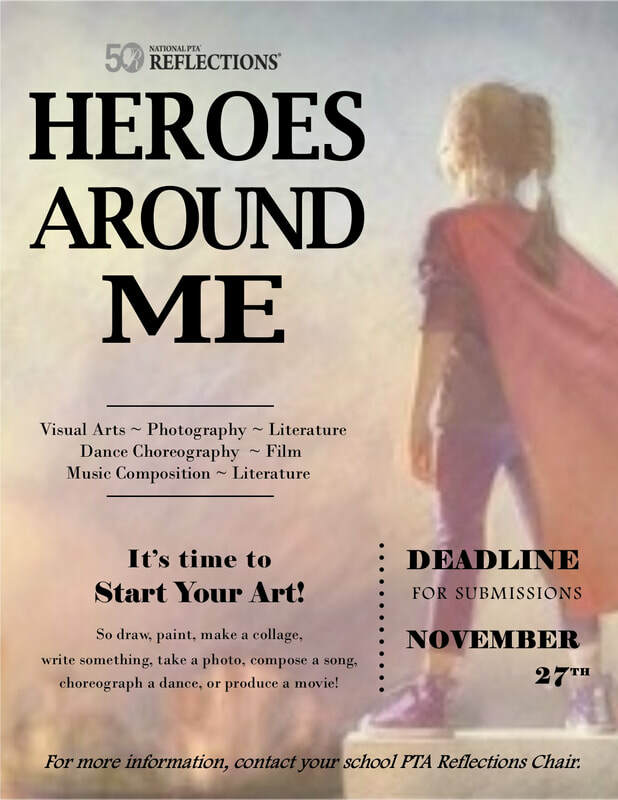 The deadline for ALHS Reflections Art Contest has been extended to December 14th. For more information see the Reflections page and follow Avon Lake PTA Reflections on Facebook. Picture day is Friday, August 25th. Volunteers are needed to help us make sure everything runs smoothly and with ease. We've broken the day down into small shifts to make it easier to help. If you can't do a complete shift, that's ok, please indicate so on the sign up. Help for multiple shifts is always welcome! Pictures will be in the auxiliary gym. Prestige will be taking senior yearbook headshots on Friday, August 25th during picture day. We are looking for parent volunteers to help out with schedule pick up from 1-3 pm and 4:50-6:30 pm, August 16. Thanks for all you do for PTA and ALHS. Welcome to Avon Lake High School! We would like to invite your student to attend freshmen orientation on Wed. Aug. 16th from 9:00-11:00 a.m. We will meet in the P.A.C., where they will be introduced to the high school administrative team, guidance counselors and the office staff. We will be presenting important academic and extra-curricular information pertinent to your student’s transition to the high school. Your student will be provided with the opportunity to tour the building with members of the National Honor Society. These upperclassmen will help your student become familiar with the building and field any questions. Your freshmen student will also be able to pick up their schedules and walk the building following their new 9th grade schedule. The printed schedule will also include the student’s locker number and combination. Clubs and various activity representatives will be available in the commons area to introduce your student to the extra-curricular opportunities available at ALHS. Please feel free to call or email me with any questions, comments or concerns. Again, welcome to ALHS! It will be a great experience! Returning 10th, 11th, and 12th graders can pick up their schedules on Wednesday, August 16th between 1:00 p.m. and 3:00 p.m. or between 5:00 p.m. and 7:00 p.m. in the High School Commons. 9th Grade Orientation (students only) will take place on Wednesday, August 16th beginning at 9:00 a.m. at Avon Lake High School. Along with schedules and locker information, students will receive important and helpful information to help make their transition to ALHS a success. Please plan on having your student attend this important event! ​ALHS PTA congratulates this year's scholarship winners: Josephine Klingshirn, and Stefan Nieschwitz. Josephine will be attending Kent State's Honor College majoring in Physical Therapy with a minor in Business. Stefan will be attending The University of Cincinnati majoring in Mechanical Engineering. CONGRATULATIONS on a job well done. Through their hard work and determination, they have proven to be student's that ALHS PTA wants to recognize and encourage to continue in their educational effort. The Avon Lake High School PTA Scholarship is made possible through PTA membership supporters, supporters of the PTA Craft Fair, and those who contribute directly to the scholarship fund. We thank all of our donors that have made the ALHS Scholarship possible. ​ALHS PTA would like to congratulate our 2014/15 scholarship winner, Theresa Klingshirn, for making Dean's List three semesters in a row at Rochester Institute of Technology. Theresa will graduate from R.I.T. in 2019 with a degree in Packaging Engineering. Theresa's Merit page at R.I.T. With this fundraising event, BJ's will donate 20% of food and soft beverages when the flyer below is presented. ​Call to Order: The meeting was called to order at 6:37 PM by President Ashley Whitehead. Clipboard Items and Volunteer Hours: There is a Christmas card from the school board and school staff on the clipboard. Please make sure you log your volunteer hours. Guest Speaker: Therese Radca with Mighty Goliath Productions spoke about the group. Mighty Goliath Productions is an independent non-profit fundraising organization that benefits the performing arts programs for Avon Lake City Schools. MGP supports the ALHS Drama Club and has helped with several improvements. The group is looking for sponsorships. They will be performing Disney’s Beauty and the Beast in February. Please visit their website at www.mightygoliath.com. Dr. Cocco has been working on the HS page of the website. There is now a link with a list of documents/forms such as important dates and senior dates that can be accessed. As he is getting requests for information, he will add to the link. Awards Ceremony will be on May 15th. Ashley Whitehead asked which senior events will be attended by JVS students if during the day. There needs to be better communication between the schools. Tina Durisek asked if a teacher has been found to head the Renaissance program. As an ALCS employee, she is willing to be the lead person. Dr. Cocco asked the PTA for money for an incentive reward. He needs $100 for gift cards. Nancy Klingshirn said this can be taken out of the assemblies fund. November 2016 minutes will be filed as written. Monthly Report for Nov/Dec- Craft show was most of the activity. The scholarship table at the craft show netted $573. Ending Cash Balance: $21786.06. Giant Eagle now gives rewards as cash. We received a check for $687. Don’t forget to patronize the Rock Pile. You have to tell them ALHS. They do not ask. Christa Olijar made a motion to direct the $687 mentioned above to the scholarship fund. Sue Mueller seconded the motion. All present voted in favor of the motion. Seven new members joined in December. The abatement for Kopf Builders passed. They are tax exempt on the buildings ONLY. Building will commence in 2017 and be completed in 2019. There will be 529 units. It is a state law that the school district MUST provide busing for grades K-8. If unable to, must provide a stipend. All day kindergarten is $2400. VIP is a program to help support kids with special needs. There are six pilot schools in Ohio. It will help enhance communication between families, schools and other support. The program runs for five years. Fifteen students preK-3rd grade will participate. Craft Fair: Ashley Whitehead- The show went well. There will be a post show meeting to see what needs to be tweaked. Parking and signs were an issue again this year. Next year’s show will be held on December 2nd. Publicity: Sue Mueller- Send any items to Sue that you would like on the Facebook page. Scholarship: Sue Mueller- We now have just over $4000 for scholarships. Applications are due by February 24th. At least one parent must be a PTA member by then. Reflections: Ashley Whitehead: There are 156 entries from ALHS. So far, seven have won best of show honors. A big thank you to Christa Olijar for helping! Staff Appreciation: Per Ashley Whitehead, the staff asked for gift cards for Christmas. 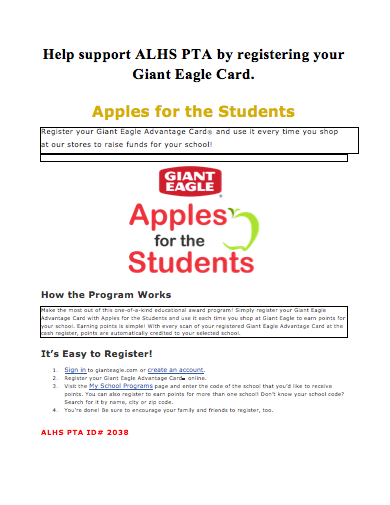 Ashley let Liesa Wetzig know that the staff members are not signing up to be PTA members so the PTA would not be providing gift cards this year. There was a discussion about only providing gift cards to staff that are PTA members as well as the janitorial staff during staff appreciation week. Nancy Klingshirn: Fundraiser at Salad Kraze for the swim team on 1/24. You need to bring a flyer which will be up on the Facebook page. Theresa Baker: The Frats, a rock group from ALHS will be performing on 1/28 at the Rock and Roll Hall of Fame in the Tri-C High School Rock Off. Tickets are $10. The next meeting will be held on Monday, February 13th at 6:30 PM. All meetings are at 6:30 p.m. in the Commons.